The next few months will — I hope & pray! — be filled with “firsts.” My summer plans include two trips to Ireland. I’ve never been to Ireland before, and along with lots of time in Dublin, I’m hoping to visit the Kilkenny Sheep & Wool Festival. 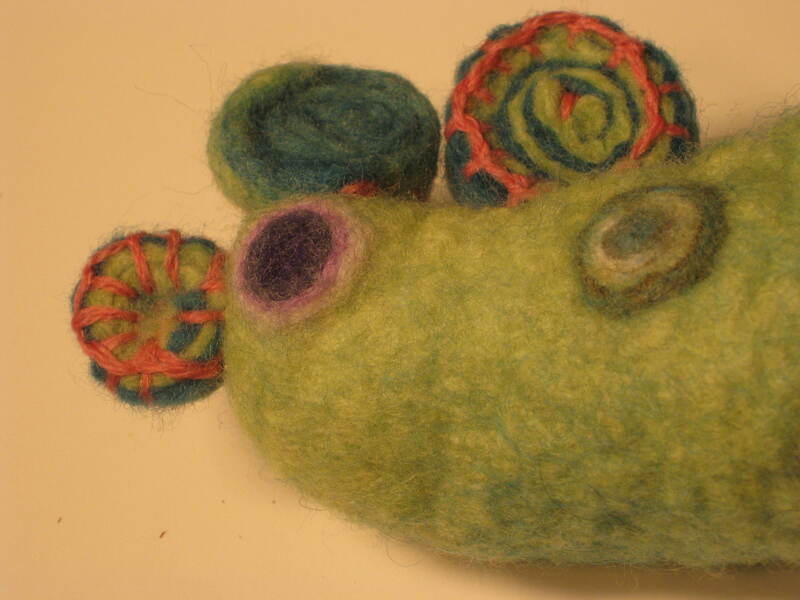 I would love to meet Nicola Brown, an Irish felter who writes the fabulous “Clasheen” blog; who just published a book, “From Felt to Friendship;” and who will be offering four felting workshops at the Kilkenny Sheep & Wool Festival. When I return from the first trip to Ireland, I’ll be getting to know my first spinning wheel — a used Ashford Traditional. When a fellow fiber artist heard that I was hoping to find a good, used wheel on which to spin “art yarn,” she generously gave me the wheel that has been sitting unused in her attic. This beautiful gift still seems surreal, since I’ve been deaydreaming about having a wheel for a long time and I’ve been joking with friends about finding a wheel “on my front porch” via magical thinking. Also, I’ve been considering other venues to sell my work, in addition to The Gallery Shop in Lemont. In the coming months I’ll explore the idea of an online venue. 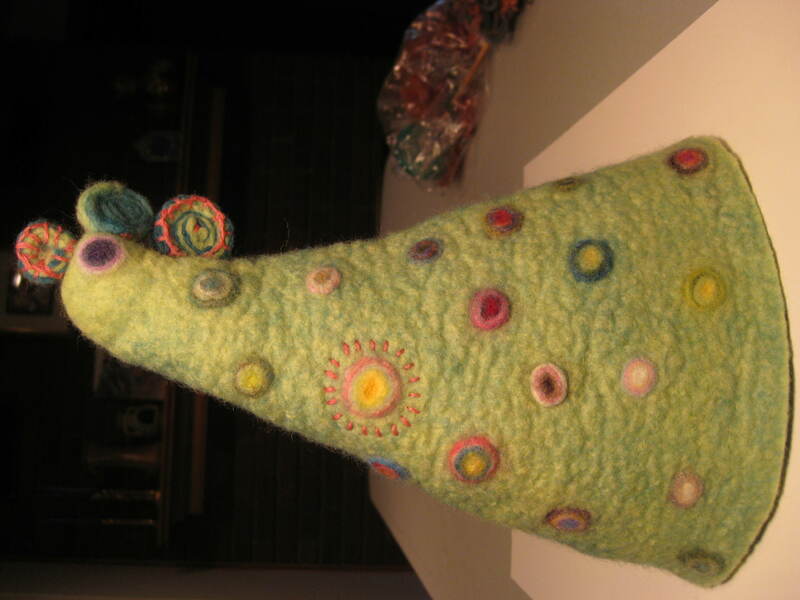 I’ll be reconfiguring my felting studio space to allow for more elbow room when I teach workshops. But first, that volcano in Iceland needs to remain quiet. I have few illusions about being the master of my fate. In traveling, in exploring, in all of those “firsts,” there are inevitable challenges. 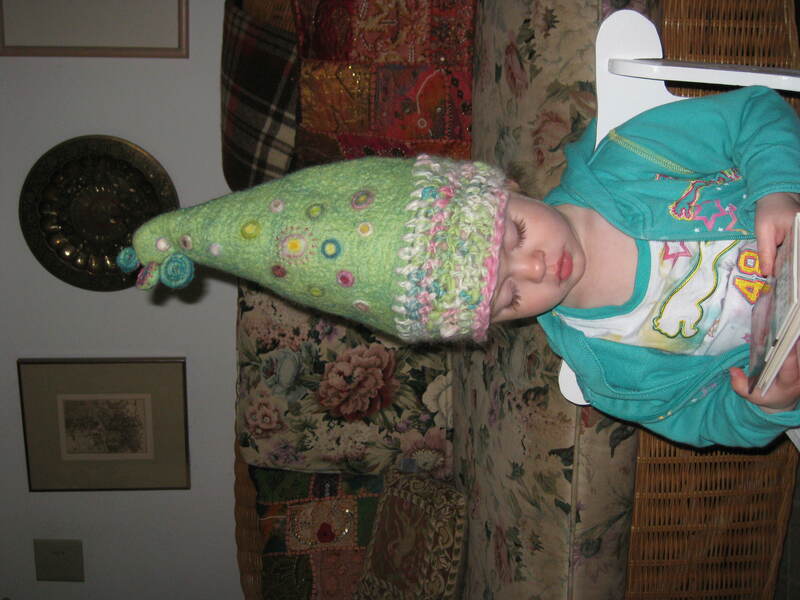 So many of the fiber artists I’ve met have a “can do” attitude. I think this is most likely because the joy at the heart of fiber arts is about figuring out new things/finding mastery/leaving mastery behind and figuring out how to do new things. A good attitude, courage, curiosity: these are gifts to bring along on a journey. A few weeks ago I read a story about how some people predict that the world will end, as “The Rapture” takes place, on May 21 — this Saturday. I’m a spiritual person, and I respect others’ religious views. While a Higher Power’s plan and timetable seem beyond my comprehension, I’ve been fortunate to have good role models and teachers whose well-lived lives help illuminate a path. With practice, on most days I can do no harm & avoid making a mess — and on good days, actually feel like I’ve been helpful. There’s a beautiful prayer that asks “Teach me to number my days, that I may attain a heart of wisdom.” I say this prayer often. 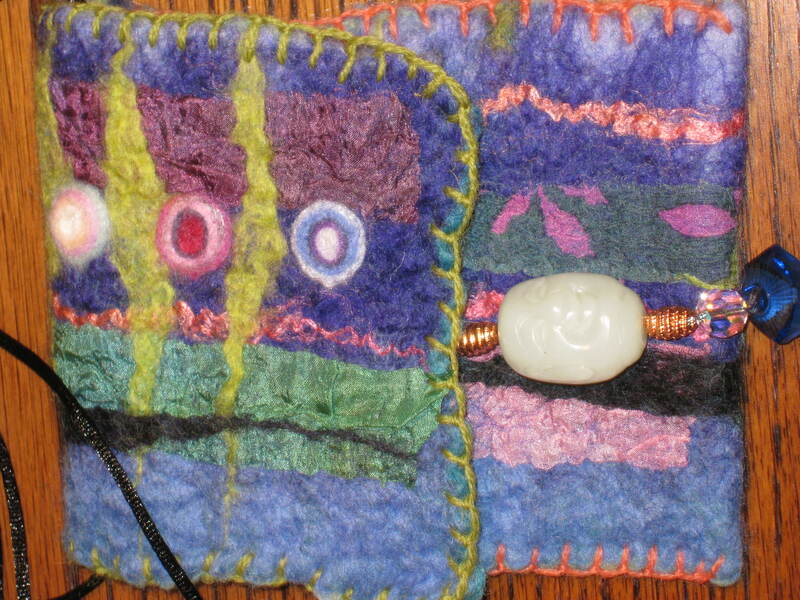 Most fiber artists I know work diligently at our crafts, grateful for the fibers. I imagine that I’m not the only one whose heart is full of gratitude for the sense of abundance that comes from being surrounded by a bountiful stash; and whose spirit is renewed by the sense of satisfaction that comes from creating something. Some part of the interior monologue as we work is a refrain of hosannahs: exclamations of praise to the Lord. 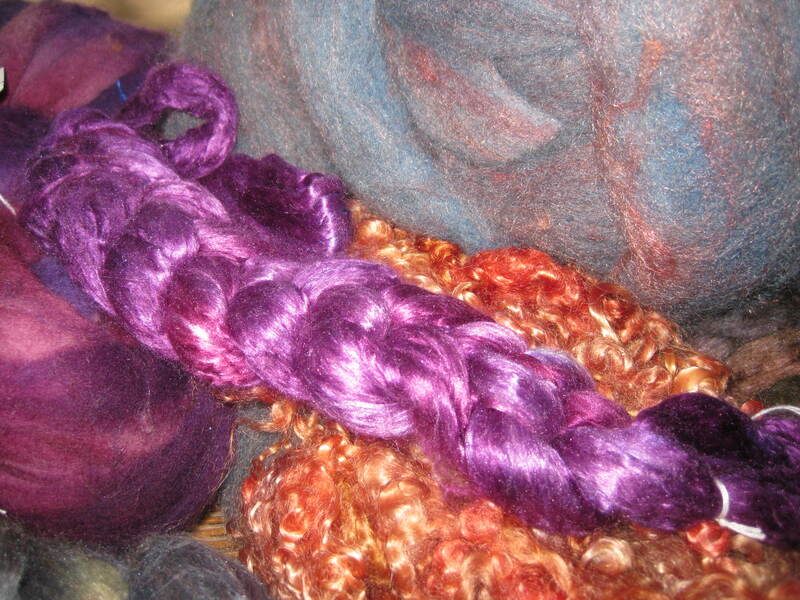 In some fiber work you can see these hosannahs shining forth. Work that is done with so much exquisite attention to detail that it expresses faith in the belief that there will be time enough. Work done with so much abandon that every inch of it expresses JOY. Work in colors that wordlessly turn on some “happy” switch in the viewer. Work that speaks of self-worth and the hope that someone will cherish it for a long time. Work that sanctifies the space it’s in. Mojito in hand, I’ll ask to be “enraptured” and carried away with joy; say a prayer of thanksgiving; and think about Lipstick Red silk fabric. I’ve been enjoying spinning yarn from a soft blue/grey/purple Corriedale natural plant-dyed top that has subtle copper silk fibers already in it. 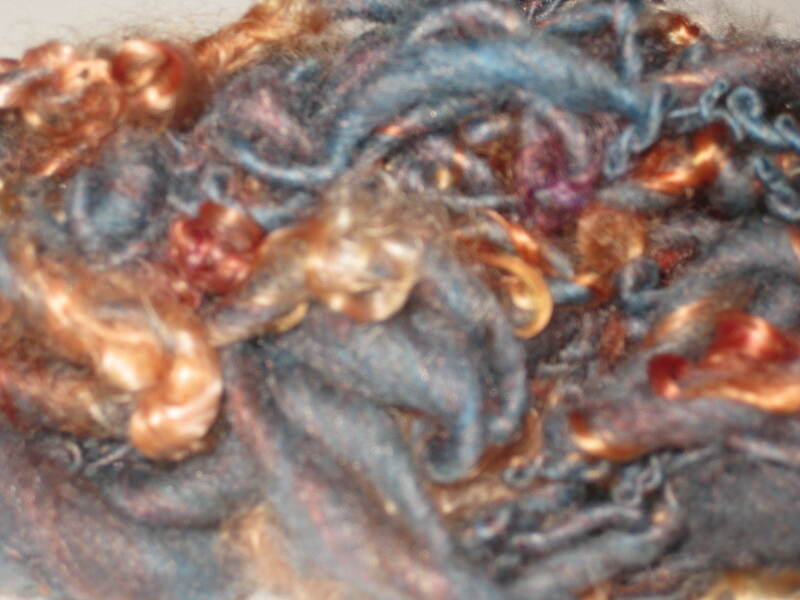 As I spin I’ve been embedding LOTS of lustrous kid mohair curly locks in bright copper and berry tones that look like tiny flames. I’ll lightly felt this yarn when done, to retain a lot of twist and to make sure it’ll look as lovely after many hand-washings as it will look when it’s newly completed. This yarn’s future will be as a long, thin scarf, and I want it to have random, looping — “blown around” — twists here and there. 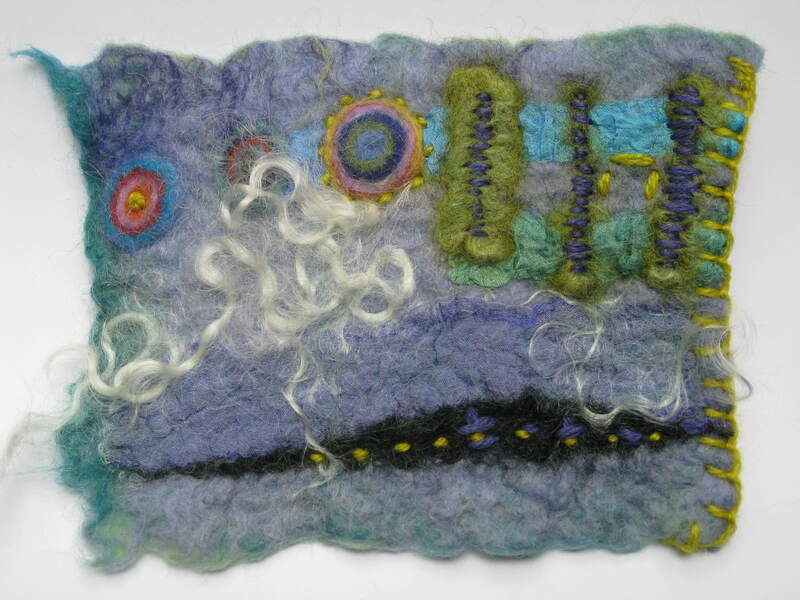 “When you create something it should look like it was blown together by the wind.” This quote was creative advice to fiber artist Janice Rosema from her Grandmother that Janice shared in a recent online interview written by “Spin Artiste” publisher Arlene Ciroula. Janice’s Grandmother’s words have been a welcome companion to my recent studio days. 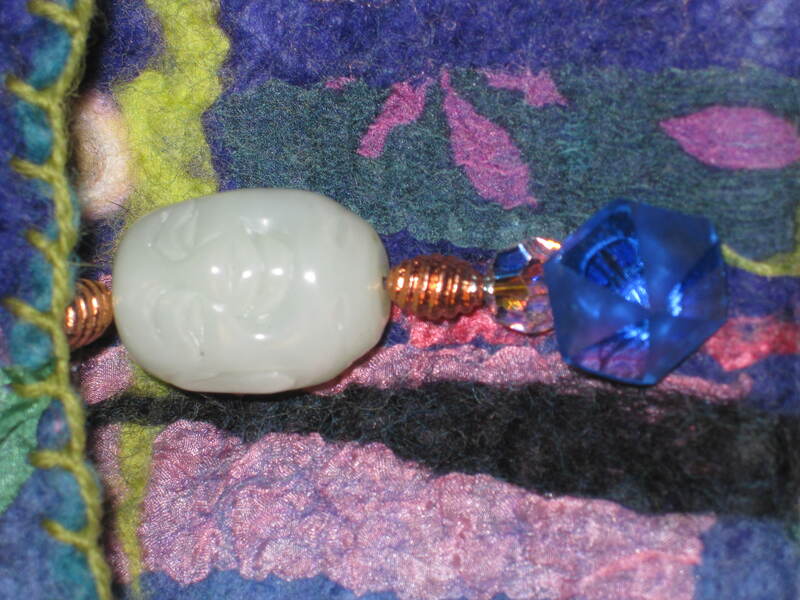 A few beads — copper, vintage, one smiling Buddha. We live in a college town — State College — within a ten minute walk from the campus. As the news unfolded late Sunday night, — about Osama Bin Laden — from our front porch we could hear students lighting firecrackers and shouting and singing in the streets downtown, as if they were somehow “released.” I thought of how these young people’s lives have been influenced by so much war and “terror.” So many in this generation of young adults understand how nuanced world events truly are. The college students I know give me hope — their eyes shine with eagerness to help the world. Despite being inconvenienced sometimes by the very few students who get attention by not behaving well, I feel lucky to live among college students, most of whom work very hard and many of whom also work at jobs and volunteer commitments. Most of the college students I know are amazing, impressive people. So young, and so wise. On Facebook, I read posts by some of these students as they communicated back and forth about whether it was right to celebrate. Whatever our political views may be, ultimately we all long for peace. The following day while our granddaughter napped near me I worked quietly on embroidering some small pieces, and as I worked I experienced how centering and peaceful it is to place one stitch next to another, as if this careful watching over a small child while stitching could somehow contribute to making the world a peaceful and beautiful place. I’ve always loved vintage embroidered things, and think about all of those busy women years ago who somehow found time to create these little works of art. Yesterday I felt kinship with them. To find an authentic place of peace within one’s own heart is one path to offer peace to the world, it’s a good orientation. For me, this feels like meditation that helps me to know how I want to participate in the world. There’s a beautiful Buddhist saying, encouraging people to “Participate joyfully in the suffering of the world.” How do we do this? By nurturing our own joyfulness, by not turning away from suffering, by orienting ourselves so that — hopefully — we can participate actively in ways that nurture joy and peace.